As part of Goodgod’s 90’s T.V. 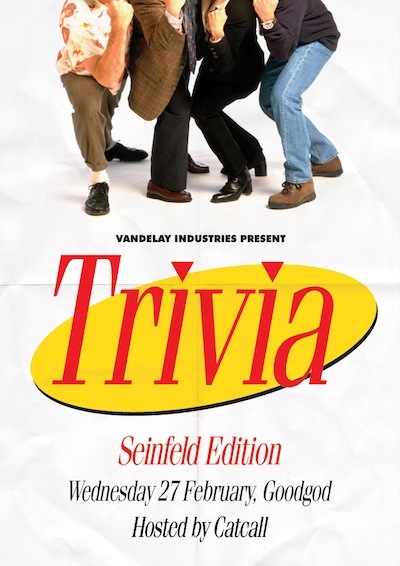 TRIVIA SERIES in February. YOU GOTTA SEE THA BABAY! Hosted by Catherine ‘Catcall‘ and her good pal Hayley Staveley, these Seinfeld masters are going to make it harder than finding pineapple Italian ice in Central Park. Prizes, tasty treats and drinks as always! Which twin got pregnant in Degrassi? Who or what were the Miraculous Mellops? Who was T-Bag? What happened in Busy’s band pants in Ready Or Not? Who can’t read, can’t talk but can read anything? What the hell was Henry’s Cat even about and why was it so BORING?! If you were a child in the 90s, or had a child in the 90s, or were really immature for your age in the 90s, this is Trivia tailor made for you. So start the Count Duckula down to Lift Off and get set to go Round The Twist. This Tripitaka down memory/puddle Lane is on the day after (The Girl From) Tomorrow. You’d have to be a Vidiot to miss it. Always free entry, with the chance to win tickets, drinks, The Dip eats, and more! 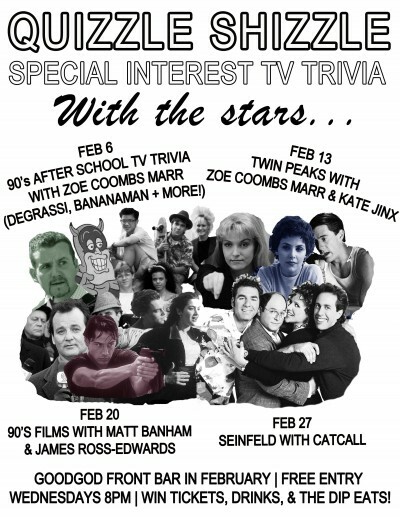 Next week: Twin Peaks with Zoe Coombs Marr and Kate Jinx! 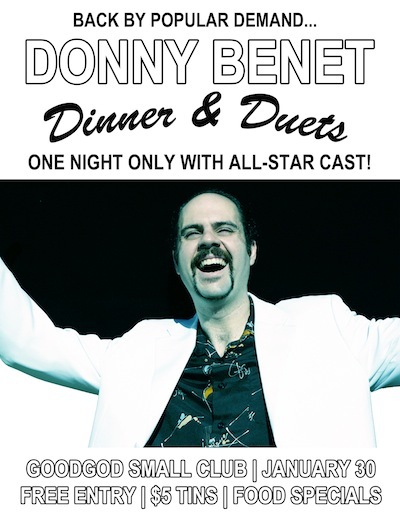 The flawless, hilarious, romantic, fantastic Donny Benet ‘Dinner & Duets’ will return again for one night only! That’s right, the people spoke and we listened. The Encore: Donny Benet ‘Dinner & Duets’ - for anyone out there who was never asked on that second date; for anyone that’s ever grieved a missed opportunity. $5 tinnies and Donnydawgs from The Dip! Join Donny Benet in the front bar for the first four Wednesdays in January to feel the heat of summer! Every week there will be a super special guest who will join the Don in duets of some of the greatest songs of all time. Tina Turner, Miami Sound Machine, Bryan Ferry… these artists will be honoured in song by hometown heroes and ‘sophisticated lovers’ ~ Kirin J Callinan, Isabella Manfredi, Spod, and Jack Ladder. After the infamous Donnydawg, grillmaster Levins from The Dip will rise to the occasion again with special Donny themed dins and $5 tins at the bar! It’s summertime – don’t deny yourself the pleasure – come down and treat yourself!